On 12 April 1914 Father Caspar Lutz, Parish Priest of Our Lady of the Rosary, Sutton, wrote to Bishop (later Archbishop) Amigo, “I am very much obliged to you for your kind contribution to the new chapel at Carshalton. We have made a successful start. On Palm Sunday afternoon the service of the Blessing of the Church was well attended and today at the first Mass in the new chapel at 09.15 we had 64 adults and 40 children present. This is about the number the chapel holds. Between 20 and 30 came to Communion”. 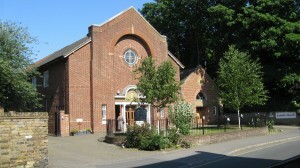 The chapel had previously been occupied for some years by the Salvation Army and before it for about fifty years by the Methodists. There were no regular Masses during the week until after the war and up to 1931 Carshalton was served from Sutton. In June 1931 Father Albert Jenner was appointed by the Bishop as the first resident priest. At first he lived in Ivydale Road. The foundation stone of the new church was laid by Bishop Amigo on 05 November 1932. He assisted at the solemn opening on 06 April 1933. The new presbytery came into use in November 1935. Records tell us that £950 was paid for the cottages on the site; £4,000 was paid for the church (only part) and £1,800 was paid for the presbytery. In August 1964, the old hall which had been used originally as the chapel was demolished and the church was extended and the complete church came into use at Easter. Towards the end of that year a new pipe organ was installed. In October 1976 work began on redesigning the sanctuary, a new altar was erected, the font was brought to the sanctuary and the church was redecorated throughout. This work was completed in time for Christmas 1976 and the final seal was put on the church when it was solemnly dedicated by the Archbishop of Southwark. Let us remember to give thanks to God, who has blessed the church here since its earliest beginnings in 1914. Let us pray for the souls of those priests who have worked in Carshalton: Father Shebbeare, who served the church from Sutton; Father Albert Jenner, the first resident priest, who died as Parish Priest of St Agatha’s Kingston; Father Anthony Kavanagh, who served the church for twenty-one years and died in 1960; Father Guido Vaccaro, who was assistant priest here, but had to retire early through ill health. We remember to pray also for all those good people young and old, who are the backbone of any parish. May God in his mercy reward them for their faithfulness in life. When we were celebrating Easter along with Good Friday we appreciated that our Lord’s rising could not have happened without his Passion and Death on Good Friday; the two are inseparable. 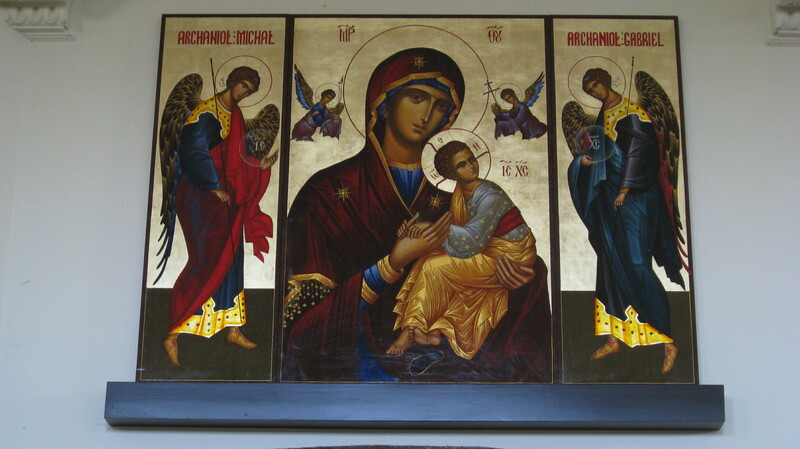 In a similar way, there are two sides to the new icon outside our Lady Chapel which need to be taken together. First, the background to our new icon is, importantly, gold because gold refers to heaven, and it is ‘through’ or ‘by means of’ the use of the icon that heaven can be seen and also helped to reach (this was after a time when in the east all images were being destroyed because images were seen as a sacrilege making, as they did, a representation of God – even of the Word made flesh. *) Then, there is Mary, who is dressed not in the blue that we are used to but in deep red, which comes near to the imperial purple that only the Byzantine emperor could wear, and which suggests something of the ‘rank’ she has in the mind of God. When we look at the letters inside the halo of Jesus, there are 0 and W and N; these represent the words, ‘He who is’. Outside Jesus’s halo and just above it are IC andXC, which are the abbreviations of the Greek for ‘Jesus Christ’. Higher up are the two pairs of letters, MP and OY, and these stand for ‘Mother of God’. On the right of the icon is the archangel Gabriel with the cross; on the left is the archangel Michael with the lance and the reed. But then, as well as seeing the icon as a neat and tidy tableau full of sacred meaning, it can also be thought of as becoming an ‘action painting’, because Jesus is not still in it. He looks at the instrument of his death and goes for the reassure-ance of his mother’s hand. Not surprisingly, she returns his grip. And then there is the suggestion that in his inner turmoil his sandal slips off. You might say that Jesus is very ‘real’ in this icon. 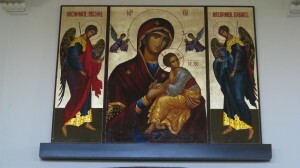 Icon painting was done with great care and also with prayer. An icon, on our part, is meant to be looked at and perhaps for us to be drawn into. As Islam took over in the east, and Constantinople was conquered, their religion forbade images, and Christians came to feel that their own devotion to images had hindered rather than helped them in standing up to the invaders because they had been conquered. So the iconoclasts wanted to destroy all images. Our icon is in the tradition of the Triumph of Orthodoxy, after the iconoclasts had stopped and the help of God to protect Christian believers, it was believed, could, after all, come through the use of icons as well as other means. Concerning the Second Commandment, which forbids images, Exodus 20:4, I have always understood that when God became Man in Jesus, part of his fulfilling the Law and the Prophets, Matthew 5:17, can be found in his coming, among other things, to be seen and heard and touched etc, 1John 1:1, and which in due course came to be shown in paintings, statues, and, of course, crucifixes. So with Christ, there is a new and fuller interpretation of the 2nd Commandment.